Airbus chief commercial officer Eric Schulz says there could be an ultra long range variant of the A350-1000 widebody developed as the manufacturer works towards meeting Qantas’s Project Sunrise challenge. The Australian flag carrier is seeking an aircraft capable of operating nonstop from Australia’s east coast to London and New York and has indicated previously it would look to issue a request for proposal some time in 2019. The challenge, as it stands currently, pits Boeing’s still-in-development 777-8X against the A350-900ULR (ultra long range) from Airbus. However, Schulz said Airbus was also looking at a potential ultra long range version of its A350-1000. “This is the flexibility we have,” Schulz told reporters on the sidelines of the International Air Transport Association (IATA) annual general meeting in Sydney on Monday afternoon. “We are looking at both options. The A350-900ULR features a modified fuel system, which increases the fuel carrying capacity by 24,000 litres (from 141,000 litres to 165,000 litres) over the standard A350-900 without the need for additional fuel tanks. This is achieved through modifications to the layout of the piping and valves within the fuel tank. There is also a performance improvement package with larger winglets, a slight twist to the wing compared with the standard A350-900, as well as changes to the flap fairing and belly fairing. The A350-900ULR has a maximum takeoff weight of 280 tonnes. 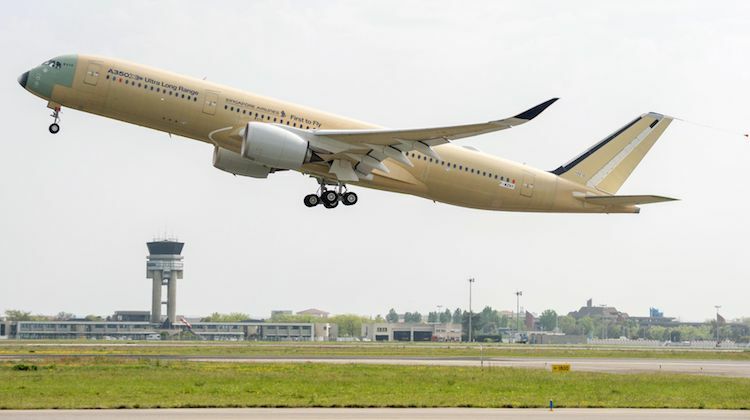 Singapore Airlines (SIA) is the launch customer for the A350-900ULR and will use the aircraft to relaunch Singapore-New York nonstop flights starting October 11. 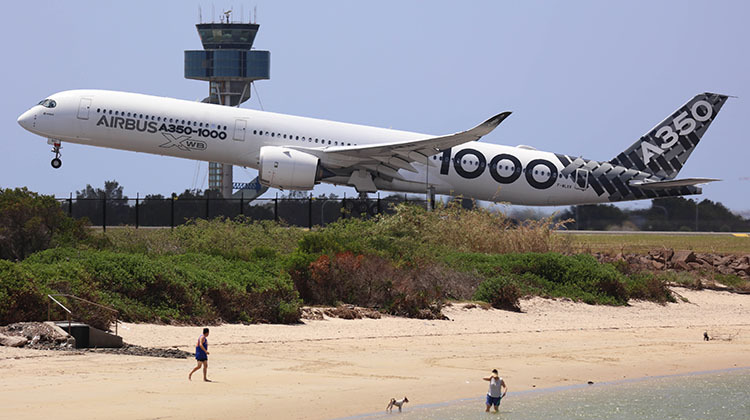 It has ordered seven A350-900ULRs and is the only airline customer of the type. SIA has configured its A350-900ULR with 161 seats comprising 67 in business class and 94 in premium economy class. Sydney-London Heathrow is 9,188nm, according to the Great circle Mapper. Meanwhile, the current A350-1000, has a range of 7,950nm, a maximum takeoff weight of 308 tonnes and a maximum fuel capacity of 156,000l, according to the Airbus website. It can carry 366 passengers in a typical seating configuration. The aircraft made its commercial debut with Qatar Airways earlier in 2018. VIDEO: A behind-the-scenes look at Qatar Airways’s first A350-1000 on the airline’s YouTube channel. Schulz said Qantas was one of a number of carriers who had ultra long haul needs. “There is an interest for other operations who have ultra long range missions to look at these options and look at these possibilities,” Schulz said. Schulz acknowledged the A350-900ULR of today was not quite up to meeting Qantas’s needs for Project Sunrise. However, there was work that could be done to improve the performance of the aircraft. “The advantage we have is that we have an A350-900ULR ultra long range which is already flying with Singapore Airlines doing Singapore to the US which is quite similar in terms of trip and operational challenges,” Schulz said. “The aircraft does a little bit less than what Project Sunrise will require but we know how to drive this. Qantas international chief executive Alison Webster said the final cabin configuration was still being worked through. “First and foremost for us we are now looking at an aircraft configuration that gives us some flexibility and an opportunity for around an over 300-passenger seat count on the aircraft for the economics to be in the right place for us,” Webster told reporters on the sidelines of the International Air Transport Association (IATA) annual general meeting in Sydney on Monday. “We are clearly still moving around though the final numbers on that because we are also looking at a four-cabin configuration of the aircraft design and again as I said these are all still works in progress. Webster said part of the cabin analysis was consideration of different zones on the aircraft for alternate activities during the estimated 21-hour sector on Sydney-London. However, what those zones would be had yet to be determined. “In terms of zones, to be honest we’re not even sure what we mean by that yet,” Webster said. 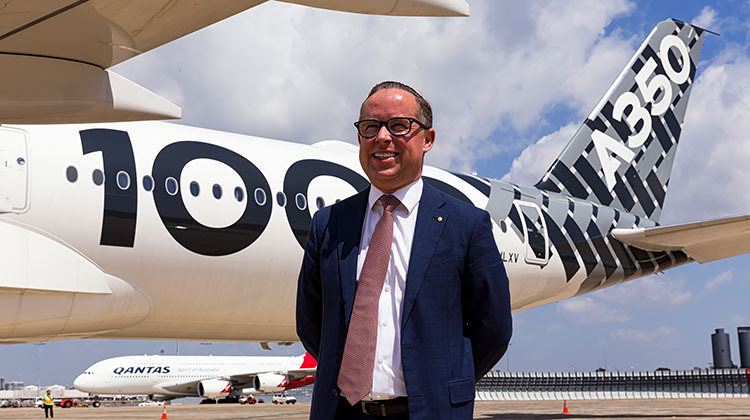 As far as the timeline was concerned, Qantas chief executive Alan Joyce said the airline was working towards finishing the technical evaluation for Project Sunrise with Airbus and Boeing by the end of calendar 2018. 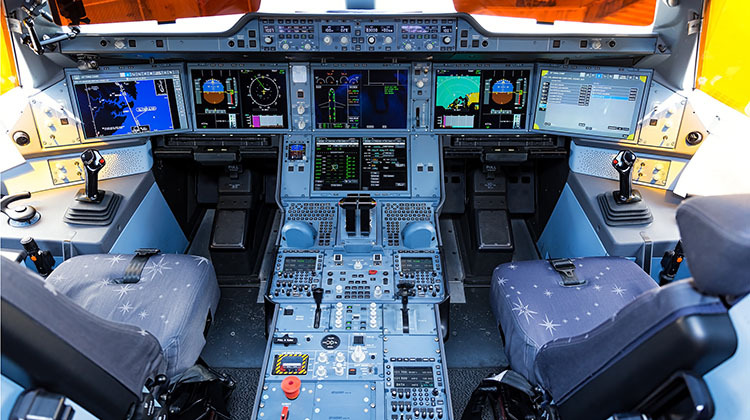 The technical evaluation included, among other matters, consultation with the regulator on fatigue management issues and crew rest rules and discussions with pilots on these ultra long haul missions. “There’s a lot of parallel processes,” Joyce told reporters on Monday. Once concluded, the process would ten move forward to a request for proposal (RFP) with both manufactures. The decision on aircraft type would then be made in 2019 for delivery in 2022, should the business case stack up. “I keep on saying if the business case works because there is a lot of logistics,” Joyce said. 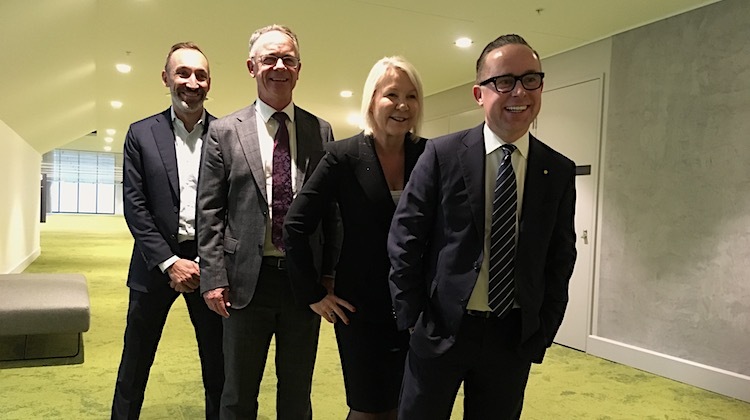 From left Jetstar group chief executive Gareth Evans, Qantas domestic chief executive Andrew David, Qantas international chief executive Alison Webster and Qantas chief executive Alan Joyce. While the A350-900ULR will begin flying in Singapore Airlines (SIA) colours from October, the 777-8X is still in development and yet to reach firm configuration. The Boeing website lists the aircraft as having a range of 8,700nm and a passenger capacity of 350-375 passengers. The aircraft is expected to enter service in 2022. However, the final specifications will only be known after further development of the aircraft design and an analysis of its engine performance. The GE9X engine began flight testing on General Electric’s flying testbed in late 2017. 21 hours in one sector is no picnic. An escorted sleepover at Singapore would be much preferable. The current engine types are marginally short on ultra long distance reliability. As a concept, the larger A380 frame with four engine dependability would better support the passenger and multiple crew complement. I don’t see how either the A350 or B777 are going to meet all of Qantas’s project requirements. The A380 could do that now with a reduced seat count, still in 4 classes, and adding the new A380 plus winglets to improve fuel economy. The reduced number of seats would also improve fuel economy through reduced weight. Saying that I don’t know why Qantas wants a 300 seat aircraft for a niche market. I believe the daily Perth London flight is getting solid bookings with the smaller 236 seat count. Would there also be a Great Circle route via the Indian Ocean, Northwest and Northern Africa and France to England? The problem with southern route great circle loops would be the amount of time over water and the ETOPS for twin-engine aircraft wouldn’t it? One of the reasons why they are still using B-747s to do the route to JNB over the Southern Ocean perhaps? I’m not in the industry so I’m not sure. As I keep saying the Boeing 747-8I can do it with a couple of minor tweaks. GE just need to PIP the engines again to reduce fuel burn by 5% and reduce the weight of the aircraft by a further 10,000kg. This can be done via additive manufacturing and use newer technologies all over in the cabin etc. GE should be using progress of the GE9x and adding to the GEnx range. Lighter more fuel-efficient engine all the airlines are screaming out for. Worse comes to worse just add 1-2 AUX tanks in the belly. Also doesn’t this new biofuel reduce fuel burn?? The aircraft would be able to transport 410 passengers. Operating costs are the same or less than current 747-400s so it’s a win win win for everyone. Win for Boeing, Win for GE, Win for Qantas and win for every airline with a 787 with GE engines!!! Why, why why? What is it with AJ? Does he just want the kudos for being the first one to achieve it from Australia? We don’t need non-stop flights to the rest of the world! He argues that businesses see merit in it. If so, let him put on a 787-8 with Business Class seats only on it. That’s what SQ is looking at doing.